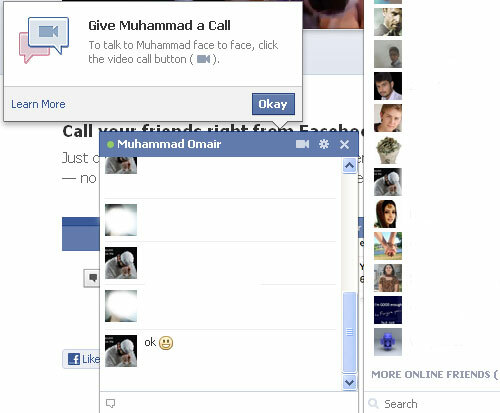 FaceBook the social networking giant have finally launched a much awaited feature video calling. This feature is launched under the banner of Skype and FaceBook. FaceBook user can not now only chat via text but also can interact with there friends via live streaming face to face without any hesitation. The video streaming is great without any pause it works like a champ. This feature do not required any additional software which is another great advantage of it. So today I will show you how you can start your fingers rolling over FaceBook video calling. 1. To start video calling with your friend, simply go to https://www.facebook.com/videocalling/ And click on Get started button to learn how to use FaceBook video chat as soon as you click the link your chat box will pop up asking you to select an available friend . 2. When you select your online friend again a new window will pop up asking you to click on the video call button. When you click on the video call button just like other video calling like Skype a bell will be ringed on your friends pc it will keep on ringing until your friend accept your video chat proposal. That’s how the whole system works if you want to call any other friend you don’t need to go to https://www.facebook.com/videocalling/ just directly click on the start video with friend button to get started. So that how you can take advantage of FaceBook’s new feature but be careful use it only for business purpose don’t expose your personal talks on the chat as it may getting recorded. Just be careful and use only when it is mostly needed. If you have any difficulty regarding this or any other topic feel free to ask.